When I was a kid, dining rooms were only used for Sunday dinners and major holidays. These days, they are becoming the busiest spot in the house. Especially if you live in a modestly sized home like Mu-Hsien Lee of Live Like You're Traveling. Her multipurpose dining nook doubles as a workspace. I will show you how she made the most of this hardworking room. Before building her cozy dining nook, Mu-Hsien created a computer sketch of the room's layout. It helped her maximize every square inch while visualizing the design. There are plenty of digital tools that will help you map out your next small space project. Below are a few of my favorites. HGTV Home Design Software: There are several different design packages all created by the famous home and garden network. Ikea Planning Tools: The most popular is their 3D Ikea Kitchen Planner. Floorplanner.com: A powerful and fun online tool that makes it easy to create 3D layouts. Homestyler.com: Their 3D Room Designer tool will allow you to place 3D models of real furniture products within a photo of your room. 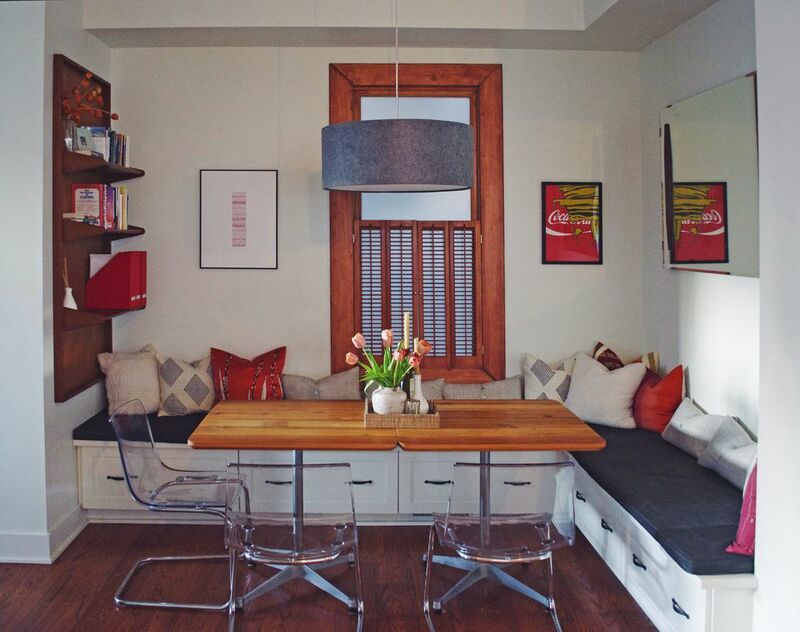 "As more families and couples use the dining room in a less formal setting, we maximized a small dining room, by building in bench seating with custom drawers. In the drawers, we have hidden and housed our office supplies, file cabinets, and even our printer. It is a creative space for daily use, and when the tables are together, it makes for a traditional dining area. It's super cozy with many throw pillows and everyone is drawn to it." You may think Mu-Hsien spent a bundle on the dining nook's built-in bench. But she didn't. The cabinet makers she hired were more affordable than an Ikea solution she considered. Just goes to show, it pays to compare prices between custom and store bought cabinets. The bench cushions were also made-to-order via her mother-in-law out of soft yet durable denim. The pillows were purchased from West Elm. The dining nook's cafe tables also have a dual purpose. When Mu-Hsien is entertaining company the tables are placed together to form a large dining table. When it's time to get to work, the tables are separated so they can function as workstations. The shelving on the wall makes great use of vertical space. It's a Midcentury piece picked up at a local antique store. What do I like best about this room? The plastic dining chairs. Because they're transparent, they don't create visual clutter.